Implementation of Salesforce CRM generally occurs as a result of a customer-centric approach. However, to build a 360-degree view of the customer, Salesforce needs to be interconnected to the entire Information System. Therefore, the implementation of a data integration software is often the corner stone and starting point of any business project involving Salesforce. Stambia's unified technology combined with its powerful Salesforce component can help to reduce deployment time to migrate to the Salesforce ecosystem. Salesforce CRM Data Integration overview with Stambia technology. "84% of CEOs are concerned about the quality of the data they’re basing their decisions on." Poor data quality has a direct impact on business activity and its profitability. To get fresh and relevant data, Salesforce must be connected to third-party tools. To provide Salesforce with quality data over time, setting up a customer data repository is often required. A data hub concept promotes data exchange with Salesforce. Although Salesforce has analytic capabilities through reports & dashboards, it is far from being a true Dataviz decision tool. How to anonymize / pseudonymize your Salesforce Data ?
" Seventy-two percent (72%) of firms said managing multiple CRM systems across countries/ technology silos is moderately to extremely challenging." Salesforce is a very powerful platform in terms of customer relationship management. How to link Salesforce to existing legacy ? How to avoid data silos and integrate Salesforce with other SaaS Cloud software ? Stambia has capabilities to create a standard API / web services layer around Salesforce to interconnect Salesforce and other applications. Stambia technology quickly links a Salesforce Cloud to Hadoop Big Data platforms to extend and enrich customer data. How the component works ? Salesforce component is fully integrated with Stambia data integration software, through "Metadata" object. Stambia can reverse the description (Reverse Engineering) of any type of information from the Salesforce application, whether it is native (standard metadata) or specific (information, table, customer-specific application). Reversing specific Salesforce field descriptions or tables, as well as internal IDs and dates, provides a comprehensive view of data and metadata. This information is used in Stambia data flows to optimize uploads or detect changes in Salesforce. Bulk mode: Enables bulk loading, with package subdivision. This option reduces the consumption of Salesforce API calls to maximize performance. At each stage of the feeding process and whichever mode selected, Stambia has the capacity to know the state of the treatment and access the management of the rejects. 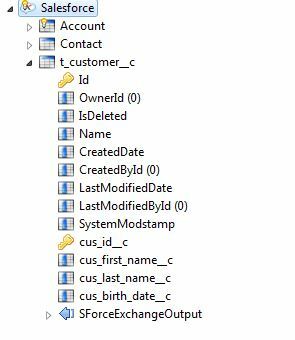 The Salesforce component allows to manage all types of data integration (Update, Insert, Upsert, Delete) and also the Recycle Bin object. This information is used to detect changes and then compare the data against the existing data in a third-party application or in a database. Stambia's replication template can quickly replicate Salesforce data to a third-party database or replicate data from that database to the Salesforce app. This can be done with simple parameters and without complexity in the design. Stambia universal mappings can also be used to complete and adapt the replication process in case it is necessary to implement particular transformations. This component is optimized for Salesforce as well as for the underlying databases, to provide the highest level of performance. The Salesforce to RDBMS replicator requires little development effort: with only a few parameters, it is possible to automatically create a source structure on the target. Replication to Databases is supported. The Replication Target can be any Rdbms Database. Change Data Capture Change Data Capture (CDC) allows to follow and store all the changes of Salesforce objects. It is supported by the Replication Template. Salesforce: All versions with API enabled. Did not find what you want on this page?